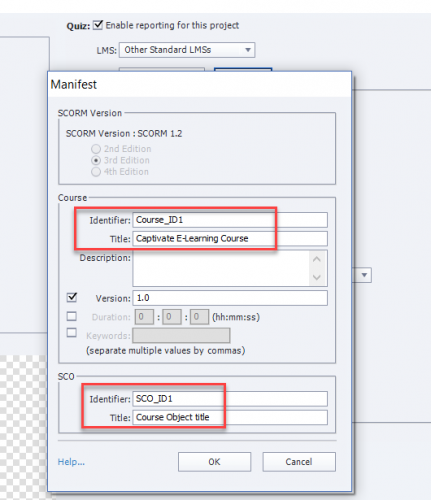 Question about whether it is beneficial to update the Course or SCO Identifier and Title fields when sharing a common cptx project as a starting point for all courses. Our team shares a cptx file that we use as a course “template” – it’s not a Captivate template file type, however. Any time we go to create a new course, we pull this common cptx from our controlled documents library, paste in our new slides, author the simulations, etc., and then publish the file. (We create solely software simulations.) 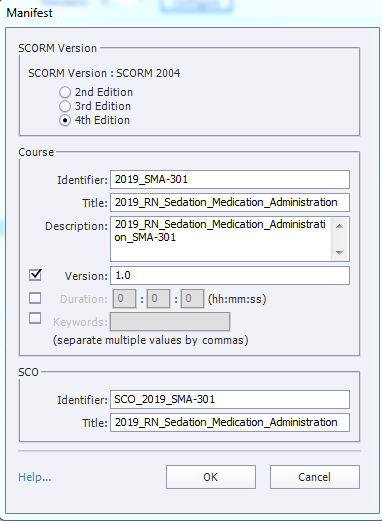 We add in scored interactive items (usually click boxes) toward the end of each individual assessment simulation, and we publish these as SCORM packages for upload to our LMS. Note: Sometimes clients will need these for their own LMS as well. Historically, we’ve published as SWF, but are moving to HTML5 only very soon (not that this is super relevant to the question – just trying to paint the picture of what we do). We typically have not edited this information (Course Identifier, Course Title, SCO Identifier, SCO Title). Is there any specific reason why we should (or should not) modify this information? Any info is helpful. Thanks! I feel that it’s important that the LMS information be filled in. That’s a discussion between you and your client as to who fills it in. When you fill in the dialog box, you will be entering known information. If you leave it blank, you generally have no idea what will be published. While I haven’t done it with a SCORM course, I have also manually edited mobile XML manifest files. I wouldn’t recommend this as you need to have an expertise in that area to ensure you don’t make a mistake. It’s fairly optional. Many learning management systems scrape from this file to populate the fields when uploading a new elearning module. Unfortunately many don’t as well. You may wish to leave it blank if your client wants to populate these fields themselves. Thanks. Sorry, I was on vacation for a few days so I didn’t see these last couple replies. Sounds like it isn’t necessarily something we have to do, but it’s something we’ll discuss as a team to see whether we or our clients have a reason to begin doing it. We add course titles to our own LMS and are able to pull reports using the title just fine. My main concern (and reason for asking) was regarding client LMSs and understanding any issues that may arise from the fact we use the same cptx to create all our courses. It dawned on me that even though we’re titling the projects differently (at the project level), this manifest information might actually be the same for all courses (and I didn’t know if this could cause any issues). Thanks for the reply! I wonder if RodWard , Lieve Weymeis , Phil Cowcill , Paul Wilson or Shambu Nashi has any insights on this issue. Here is the attachment from my comment above. Thanks, Wayne Armstrong – did you intend to add a comment too? I see in your screenshot that you do update this information. I’m interested in knowing what advantages or benefits this provides you. Thanks! I guess my comment did not post. Basically, I had said that I was unsure of what the benefits were. 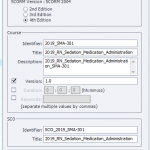 I figured the benefits would be related to sorting scorm data into an LRS (Learning Record Store) for later separation and use. I have found very little information that speaks to this issue. I figured I would include unique identifiers as standard practice in preparation of transitioning from Scorm 2004 to xAPI. I linked a few of the top people on the forum who may be able to bring some clarity. Will do that following this post in case that is what caused my post to not submit properly. Good to meet you by the way. I am in Southeast Missouri working at SoutheastHEALTH. I don’t think I met you when we implemented Cerner here at the hospital. Makes sense. Thanks for your input! You too, Wayne. Interesting we happen to be that close. I work internally on our eLearning team, which produces workflow simulations and videos based on our company’s recommended solution configurations per our “Model” system. I don’t travel out to client sites currently, but our training assets do reach a large number of clients worldwide who choose not to customize their eLearning. I have changed them in mine to look like the attached screenshot. I only did that so that I could differentiate the SCORM data at a later date. Honestly, I have not understood the full benefit of doing it this way but it got me thinking when considering xAPI and how to differentiate the course info and results. I too don’t have a clear understanding of how and what this could impact. I have not had any issues I am aware of by changing it. Hopefully, community aces like Lieve Weymeis , RodWard , Paul Wilson , Pooja Jaisingh could assist.